Founded in 1981 in Chicago, IL. Thrust started the metal scene by opening for such acts as Motorhead, Michael Schenker, and Twisted Sister and Slayer. 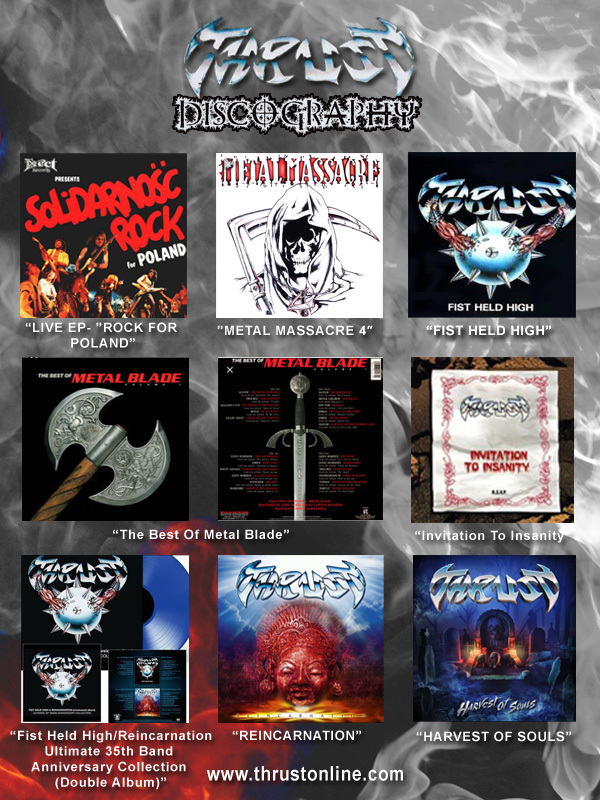 After gathering a quick and large following, THRUST began headlining and was signed to ERECT RECORDS releasing the classic “LIVE EP- ”ROCK FOR POLAND” in front of 10,000 metal maniacs. Thrust was then signed to METAL BLADE RECORDS and recorded “DESTRUCTOR” on the classic ”METAL MASSACRE 4″ album and soon was opening for JUDAS PRIEST on the Screaming for Vengeance tour. THRUST then released their debut album with Metal Blade Records called “FIST HELD HIGH” which became a cult classic. In celebration of THRUST’s 35th anniversary, Metal Blade Records released the ultimate edition of the band’s classical 1984 album “Fist Held High”… Including the entire album, with live and demo tracks from the beginning until the late 80’s, plus the UNRELEASED studio album, “REINCARNATION” produced and Engineered by Pat Regan and Bob Kulick! THRUST played the 2016 Keep It True Festival in Germany to a sold out crowd with an overwhelming welcome, followed by another sold out night at Frost and Fire Festival in Ventura CA, then went on to the Up The Hammers Festival in Athens Greece, where they were welcomed by metal fans from all over the world! THRUST has finished a new album entitled “Harvest of Souls” and cant wait to bring it to you in early 2018!!! THRUST is primed and ready to bring their “In your face”, arena ready show, to a new generation of rockers around the world! that have tour & stage experience between the 5 of them, totaling well over 100 years! Pure Steel Records are excited to announce the worldwide signing of American Metal greats THRUST IN 2018! Over the years, THRUST have earned a tremendous fan following due their live performances as both headliner and as support act for MOTORHEAD, TWISTED SISTER, MICHAEL SHENKER GROUP (MSG) and the mighty JUDAS PRIEST! In 2017, the band began writing music for the forthcoming new album “HARVEST OF SOULS” that we PURE STEEL RECORDS will unleash to Metal fans around the world in April 2018. Details on all will be forthcoming! In the meantime, join us in congratulating and welcoming THRUST to the PURE STEEL Family!